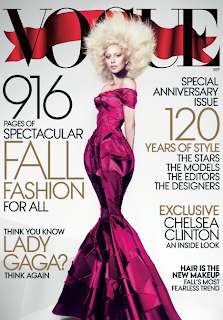 kandeej.com: Who's That Lady on the Cover of Vogue!?! As I went to get in line at the grocery store...the hot pink dress and the regal looking banner on the cover of Vogue, caught my eye. Then I had to lean in closer to get a better look...."who is that on the cover? ", I thought as I got even closer. After looking for a few more seconds....I thought, "wow! that IS Lady Gaga! ".....And I have to say, I kinda' think I liked it. Some peeps might say it's crazy, outlandish, weird, what-have-you- but that's part of the Lady's show-man-ship-style. It wouldn't be Gaga if it wasn't a mix of all those things. You know when you see Lady Gaga, it's gonna be somethin' else! I loved her make-up. Her face seems to look so exotic, clean and fresh... a naturally-kinda beauty that is nice to see on her. I think she looks beautiful. Do you like the Vogue Cover of Gaga?!? Some people might say the hair looks like a Truffula Tree from the Lorax, but I kinda love it for some reason! Do you la-la-la love it? Or do you pah-pah-pah-pah- pass on this look? Or what other celeb did you think it was at first?! La-la-la-love it! It also caught my eye when I passed by it at the store. Lol, @ calorie free candy!! I love the look and the dress was so pretty. I agree her make up was very fresh looking! As for the hair it brought that edge that she does well!! Happy Saturday Kandee!!! I la-la-la love it. Love Lady Gaga's natural makeup look. Love the dress for the curves and shape. It definitely screams couture. And I love how her hair is anti-cookie-cutter; countertive to the dress. Kind of going hand in hand. Honestly,that photo makes it look like she's had some kinda plastic surgery. She doesn't look like herself at all which could also explain why you had to look so hard to figure out who she was. I hope I'm wrong, but with the depressing trend of increasingly younger celebrities going under the knife (Kim Kardashian etc. ), it wouldn't too far-fetched. I love it, but her head looks odd on her body...it looks glued on. This is the best I have ever seen her look.